Have you ever looked out at your garden or the front of your house and wondered the only things spoiling the view are your ugly plastic wheelie bins? Now you can hide wheelie bins away in between collection days with a wheelie bin storage. Often we are forced to store our wheelie bins either in our front or back of our homes or gardens. Unfortunately, they’re quite ugly and can be easily knocked over – spreading your rubbish everywhere. Luckily, we have a solution for you – wheelie bin storage! We can supply a range of wheelie bin storage which can hold one, two, three or four wheelie bins (on special orders up to eight), featuring easy lifting lids and large doors. A wheelie bin store will keep your bins cool in summer and have ventilation slats – to allow nasty niffs to escape. Available made from either plastic, metal or timber. Our WOOD wheelie bin stores are perfect for hiding your unsightly plastic recycling and rubbish bins! Designed to fit one, two or up to four standard wheelie bins of various standard sizes (120l and 240l). Cleverly, they also open at the top and at the front for ease of access to your wheelie bin store! 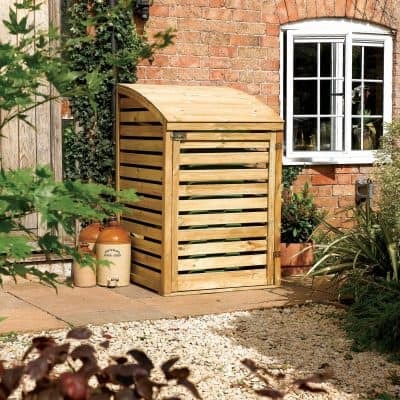 All our wooden wheelie bin storage units are made from pressure-treated wood to keep it well protected against all weather, and come with a 15 year anti-rot guarantee. They can be ordered in any color you like. We offer also metal storage solutions for your wheelie bins. These have normally a double purpose. On one hand will keep your ugly plastic wheelie bins away from your eyes and two serves a a secure storage area for your bicycles or other items you may store in it in front of your house or in your garden. Comes in various sizes and colors. We also offer a plastic wheelie bin store units serving the same purpose; for hiding your unsightly plastic recycling and rubbish bins in front of your home or in your garden! Designed to fit two standard wheelie bins. Cleverly, they also open at the top and at the front for ease of access to your wheelie bin store!. Built from durable plastic that will keep your wheelie bin out of site and secure. We offer a wide range of built-in solution for waste storage whether we talk about your kitchen, garage or your garden. Our built-in waste storage solutions will help you store your normal and recycled waste in the most efficient and comfortable way.